Following UBM’s recognition from the UFI Sustainable Development Committee, Natasja O’Connor (pictured centre), UBM EMEA events operations and services group director, Volker Höntsch (pictured right), group supply chain and sustainability manager and Lucille Ryan (pictured left), sustainability manager, sit down with EN to talk about the state of sustainability in the exhibition industry. What’s the biggest challenge you face when trying to run sustainable events? Our challenges have changed with time, as our approach to sustainability has developed and the associated key areas of focus. Initially we needed to address those parts of the event where sustainability was most deliverable. To do this our main challenge was the engagement of all of our internal teams, and the adaption of new processes for the continued successful delivery of the event. As our approach developed past our direct influence to other elements of the event, our key challenge was the fact that the sustainable performance of any of our events is dependent on the credentials and performance of our venues, contractors and the action of our exhibitors. In order to tackle these issues close collaboration, shared vision of what we want to achieve, and a clear understanding of the business case for achieving a sustainable event has been a key challenge. Is it easy to find suppliers/contractors/venues who can meet your sustainability requirements? When we first started assessing the sustainability of our events back in 2010 there was no option for LED lights and sustainable signage material, energy and waste data was not captured, recycled paper was not used, and no one was assessing the waste generated by what we built. 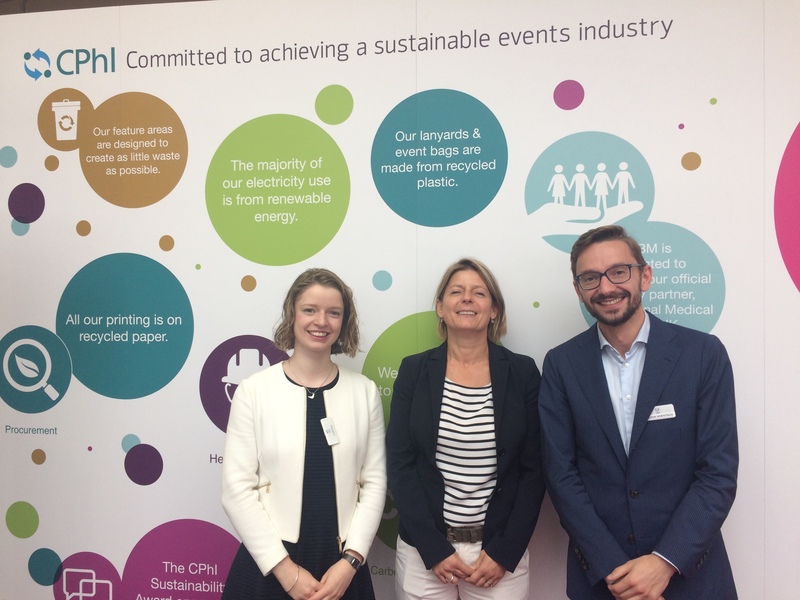 But now, for example, through working with our suppliers, we have LED for all our shell schemes and special features, we are able to calculate the carbon impact of our events, and 92 per cent of our printing is on recycled paper. We are definitely seeing an increase in the understanding of key issues around sustainability from our contractors and venues. There is an increase in the kind of necessary actions taking place, but real innovation is still only occurring within pockets of the industry. For the events industry to make clear strides forward to ensure that sustainability strategies across the entire supply chain are implemented more progress is needed by all players involved. Do you think the exhibition industry as a whole is moving in the right direction when it comes to sustainability? What more could we be doing? The exhibition industry as a whole is moving in the right direction with impactful and exciting projects being implemented by companies across the industry. But progress could and should be accelerated in order for us to avoid any delay in attaining a sustainable events industry. While engaging with venues and suppliers we often hear that we are one of the very few organisers that have made such strides in delivering a sustainable event. There are some venues that have truly excellent sustainability processes (e.g. waste management, energy saving initiatives) in place, however these are still exceptions. Unfortunately, at the moment many companies within the events industry have not realised what the financial benefits are for implementing sustainability and Health and Safety strategies . An industry-wide commitment to more sustainable business practices will be a benefit for the whole industry. As an industry; organisers, venues and contractors need increasingly to come together to discuss the big challenges we face, to set a standard for what best practice we wish to see across the board, to discuss the tightening of regulations and to build a platform for innovation of how we address our key sustainability challenges. Do you have any sustainability initiatives you’d like to highlight? In order to drive forward the sustainability agenda for our events we have developed a system which allows us to monitor each of our events performance, therefore allowing us to identify areas for improvement and also share best practices within the company. This system monitors our performance with regard to our stakeholder engagement; carbon mitigation; material use and waste management; procurement; charitable giving and community engagement; and our health, safety and security. As a part of this we calculate our events carbon impact, we asses each events performance against 10 key sustainability KPIs, and we provide each event with a detailed sustainability report. We ensure everyone from senior management through to members of each department are aware of the events performance and are engaged with driving continual improvement. It’s this system which has led to our key sustainability achievements. As mentioned earlier, the biggest part of our environmental impact is not directly caused by us, but enabled by us. Exhibitors are able to choose their own stand builders and the stands they bring on site to our shows. As an organiser we have the opportunity to foster sustainability through more targeted regulation. As a part of our commitment to enhance our customer experience at our events continuously, including sustainability and health &safety considerations, we are introducing a key change to our stand construction and prefabrication regulations for CPhI WW 2018. UBM EMEA (now part of Informa PLC) aims to ban all disposable ‘space-only’ stands over the next three years. Stands will be required to use a reusable structure such as, but not limited to, system builds or stock panels for their main structure. Therefore the creation onsite of the structure of a stand from raw materials will be prohibited, from one time use MDF or similar boards. Customer experience: A quicker, smoother, cleaner build-up and break-down, will be an improved experience for our exhibitors. Time pressures: By changing the build of our stands, we will be able to reduce the current number of tenancy days which will be a cost-saving for the exhibitors. Health and Safety: This will help to eliminate risks associated with structure, carcinogenic dust, fire, working at height, and dangerous working practices. Sustainability: We will increase the sustainability of our events by helping to tackle our main cause of waste. UBM Global set the ambitious target of reducing CO2 Emissions by 11.4 per cent by 2020. UBM EMEA is of course actively contributing to make this goal a reality. Looking at the figures the biggest impact on carbon emissions is due to the energy usage at our shows. Therefore, UBM EMEA increases its use of renewable energy every year. In 2016, six per cent of our electricity use was renewable; in 2017 this increased to 19 per cent. For 2018, UBM EMEA events have made the positive decision to switch 100 per cent of our events’ electricity use to renewable energy. As renewable electricity is carbon neutral, we estimate that this will reduce UBM EMEA’s event carbon impact by a staggering 65 per cent. Through our community and charitable giving we ensure that we support both our local and industry communities – We do this through donating our time, our skills, and our resources. One of our key aims is for all our events to have a strong partnership with a charity relevant to their industry. In 2017, 23 of our events achieved this aim, and as a result over £300k was donated through giving in kind and fundraising. We are particularly proud of our Food Portfolios partnership with The Hunger Project, our Pharma Portfolios partnership with International Medical Corps and the Decorex partnership with Fine Cell Work. Another of our key achievement for 2017 was that over 30 per cent of UBM EMEA employees volunteered, in total 1,647 hours were spent supporting our local communities.